In a frying pan, add the oil and sauté the onion. When golden brown, lower the heat and add the beans, bean broth and season with a little salt. Using a potato masher, mash the beans to create a thick purée. Stir the beans constantly until the mixture begins to dry out. Serve hot and sprinkle with crumbled queso fresco (a traditional Mexican cheese), alongside corn or flour tortilla chips. Try to be patient, this recipe takes time but the results are exquisitos! Frijoles refritos or refried beans are a sabroso side dish great for pairing with chilaquiles, classic enchiladas, or just for spreading over tostadas or sopecitos - small, thick tortillas. It can be served as an appetizer and used to prepare famous Mexican molletes. 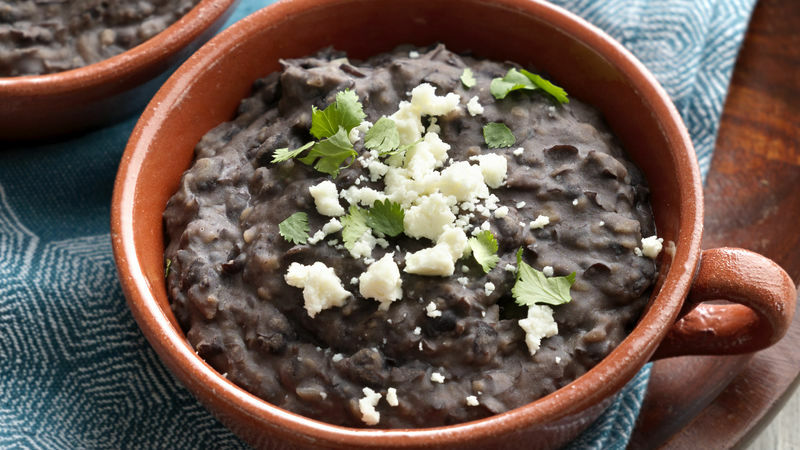 Refried beans are very easy to make, but the trick is to be patient and use very little liquid. Here I will share with you the secrets behind making this delicioso dish. Let’s cook!